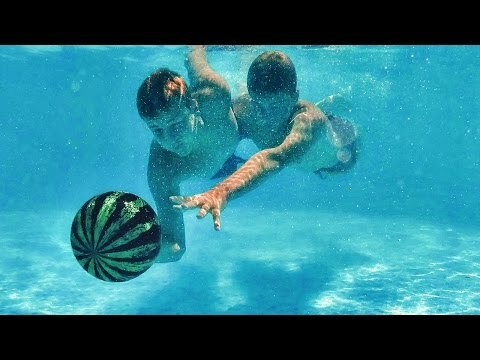 For your next swimming pool game, toss around a Watermelon... Ball. Modeled after a real-life watermelon, this rubber ball can be dribbled, kicked, passed, and bounced—all under water. Fill it up with water and a little bit of air to make it neutrally buoyant—its density will match that of the surrounding water, so it doesn’t sink or float. Instead, it stays suspended in the H2O. The kids played with this for hours. Grandkids took to the pool everytime they went. Had fun sharing with others and were often asked :\"Where did you get that?" It’s a Christmas gift! Won’t get a reaction much before June 2019! the kids loved it before it was lost when the house burned down in the Carr fire. After the rebuild maybe there will be another in our future. My kids love this thing! My 12 year old son and 10 year old daughter love this thing! They have played with it for hours on end. 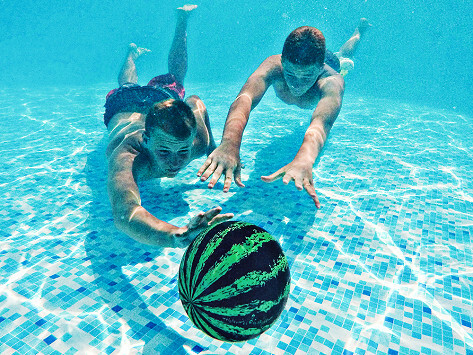 Up your swimming pool game with the Watermelon Ball. We’ll explain. Apparently tossing around a real-life watermelon in water as entertainment is a thing. They behave differently than most air-filled balls, so you can actually dribble, kick, pass, and bounce them—all under water. The Watermelon Ball is made of tough rubber. You can fill it up with water and just a little bit of air to get it at the right buoyancy. Throw it up to 10 feet under water and combine elements of football, basketball, and rugby for some unconventional aquatic entertainment. Or toss it around outside the water, too. Turns out no part of the pool is off bounds with this summer game changer.